Special occasions deserve a celebration. And when it comes to celebrating, you want only the best for your guests. 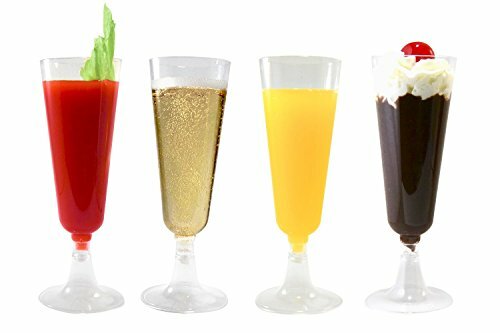 With BloominGoods 7-Ounce Wine Cups, you can serve drinks up in style without the worry of glasses breaking and long hours of cleaning. Add a touch of class and elegance to any occasion with wine glasses that are disposable and recyclable. Expertly crafted using durable, sturdy plastic construction, these glasses are made to resist breakage and snapping. The 100% food grade plastic is also BPA- and toxic-free, ensuring a safe drinking experience for you and your guests. What really makes these clear cups stand out are the rim and base, furnished in your choice of radiant gold or shimmering silver. Adding a contemporary touch to any event, these wine glasses are sure to brighten any setting. 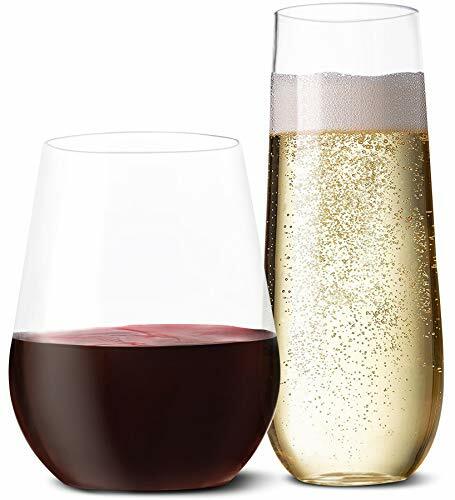 Each glass boasts a 7.5-ounce capacity, perfect for serving up your favorite white, red or ros wine at a special gathering. After some simple assembly, the cups are easy to hold in your hand and offer up a perfect amount of sophistication to turn your ordinary event into a spectacular one. The 50-count package provides a sufficient supply to serve all your guests, making lovely additions next to each place setting or beautifully adorning a table or bar for serving themselves. Adding convenience when entertaining, these wine glasses will free up your time so you can enjoy socializing with your guests instead of spending all your time in the kitchen. HIGH-QUALITY CONSTRUCTION. Made with 100% food grade plastic, these BloominGoods Gold Trim Disposable Wine Cups are BPA- and toxic-free to ensure safe consumption of beverages. The durable, sturdy construction is made to resist breakage and snapping to last throughout the entire event. 50-PACK SET. Don't run out of wine glasses at your next party or family function. This set includes 50 cups to accommodate all your guests, making them perfect for weddings, anniversaries, birthdays, holidays and other upscale occasions. ELEGANT DESIGN. BloominGoods Gold Rim Wine Cups are crystal clear, beautifully enhanced with a rimmed border and base in either gold or silver. Boasting an elegant, shiny look that is perfect for all occasions, they will add an elegant, contemporary touch to any special occasion. DISPOSABLE CUPS. Save yourself time when cleaning up and enjoy entertaining instead. These cups are disposable and recyclable for added convenience, plus you don't have to worry about your expensive wine glasses being broken. PERFECT SIZE. Furnishing a 7-ounce capacity, this cup is great for serving a variety of whites, reds and ros s at your next party. They're easy to hold in your hand, combining the ideal size for wine beverages and the perfect amount of elegance to upgrade any event. CONVENIENT ELEGANCE - Add a touch of style to any event without the risk of broken glass. Each package comes with 7 sets of 6 flutes individually sealed to provide convenience and sanitary cleanliness. Can't use all 42 in 1 gathering? No problem, store the extras in their already-sealed packaging. PERFECT QUANTITY - Endless uses!! 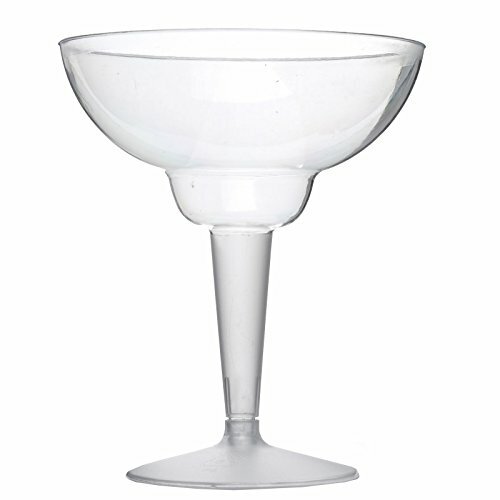 Great for champagne, mimosas, bloody mary's, moscato, sangria, sodas, wine and sparkling wines, cocktails, Bellini, sparkling cider, lemonade, Limoncello, Prosecco, spritzers and sparklers, mojitos, chocolate mousse, pudding, Jello, ice cream sundaes, parfaits, sorbet and other desserts. PREMIUM QUALITY - .7MM thickness for durability and resilience. PERFECT SIZE FOR ANY PURPOSE - Capacity: 5.5 ounce. Multi-use functions make it a practical serving size for any beverage or dessert. Special occasions deserve a celebration. And when it comes to celebrating, you want only the best for your guests. With BloominGoods 7.5-Ounce Wine Cups, you can serve drinks up in style without the worry of glasses breaking and long hours of cleaning. HIGH-QUALITY CONSTRUCTION. Made with 100% food grade plastic, these BloominGoods Disposable Wine Cups are BPA- and toxic-free to ensure safe consumption of beverages. The durable, sturdy construction is made to resist breakage and snapping to last throughout the entire event. The crystal clear glasses are beautiful adding an elegant, contemporary touch to any special occasion, this radiant look is perfect for all occasions. PERFECT SIZE. 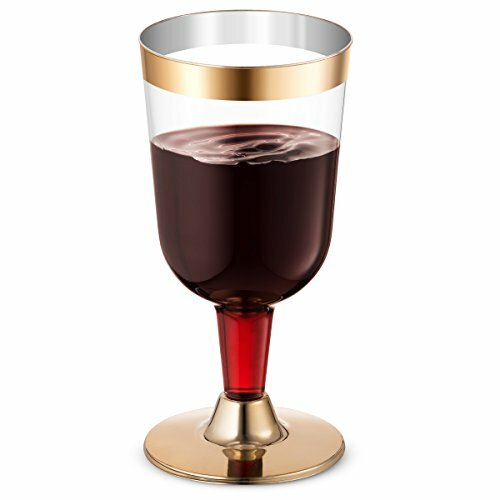 Furnishing a 7.5-ounce capacity, this cup is great for serving a variety of whites, reds and ros s at your next party. They're easy to hold in your hand, combining the ideal size for wine beverages and the perfect amount of elegance to upgrade any event. Gold adds elegance to any occasion and chevron adds a fresh and trendy pattern. These are great for a gala event, wedding, birthday, Christmas or anniversary celebration. 100% Biodegradable. Our straws won't get soggy or fall apart and biodegradable as well. 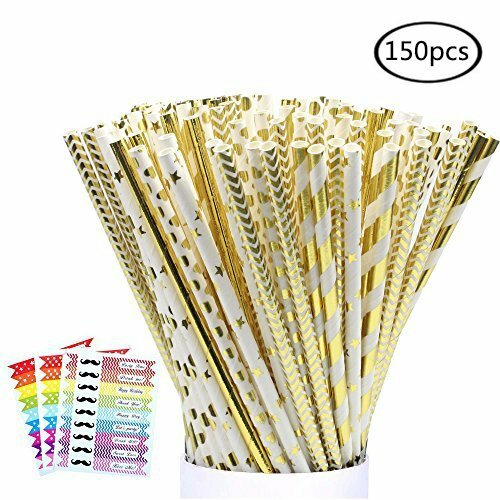 Each package contains 150 straws with 3 stickers. TOSSWARE is the perfect upscale disposable (but 100% recyclable!) drinkware for any occasion. 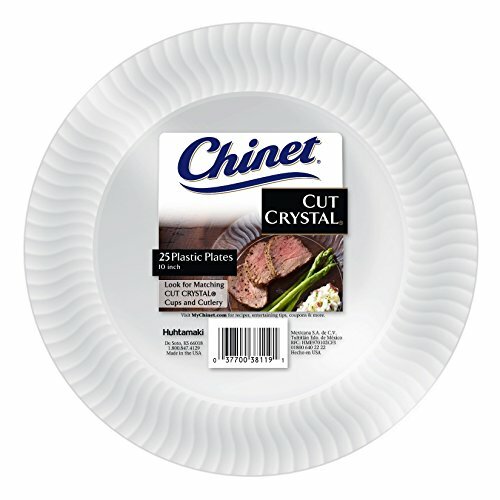 Our products embody the elegant look and feel of crystal without the shatter. Best of all, they are BPA-free and made with the highest quality recycled PET polymer, so you can save the planet without sacrificing sophistication. It s style meets simplicity with TOSSWARE! We designed our glasses to not only look good, but feel great too! 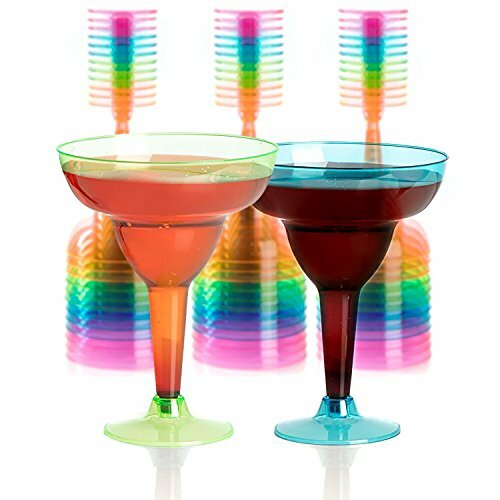 You deserve to have an amazing party with high quality stemware to go along with it. Our wine glasses are always made with the best possible materials. These glasses are made from a food-safe plastic (PET) and are 100% recyclable. With these glasses you can wave goodbye to cleanup and broken glass! Combining the best materials and design, we have designed these cups to be the perfect companion to parties. Your guests at the party are going to be impressed with these transparent and crystal clear glasses, only the sturdiest unbreakable cups in the market for you. Weddings, baby showers and mimosa bars - all the reasons you can celebrate! We made these extra heavy to prevent guests from accidentally tipping the glasses over on the table. Spend more time with family and friends and save yourself the hassle of clean up with these disposable wine glasses! We are always playing hosts here at Glowcoast - and we wanted to create that perfect drinkware set that can be perfectly at home at parties or even for a family picnic by the park! These wine glasses can be easily taken to go for your convenience. Here at Glowcoast we pride ourselves on always delivering gorgeously designed goods which are both stylish and practical. We stand by the quality of our products and we will offer you the 100% satisfaction guarantee. If you aren't satisfied in ANY way, reach out to us for your money back. 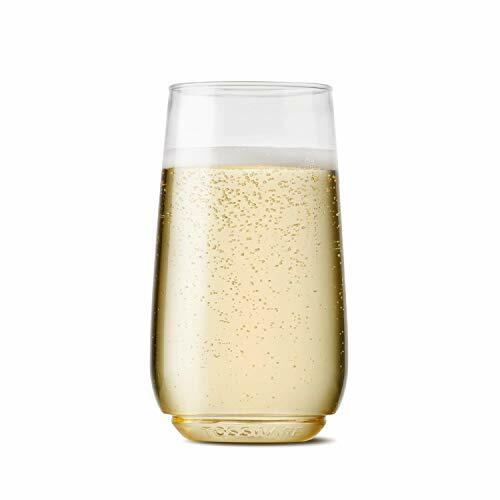 QUALITY PLASTIC STEMWARE TO IMPRESS GUESTS - These champagne flutes (9 oz) and wine glasses (16 oz) feel great in the hand. You'll get all the convenience of disposable stemware with the appearance of traditional glassware. UNBREAKABLE TO PREVENT ACCIDENTS - Shatterproof BPA-free plastic glasses prevent accidental breakage at your party and saves you the clean up! SAVES YOU TIME CLEANING AND SPACE IN KITCHEN - Disposable glasses mean that you can simply toss them out after, saving time and space on cleaning and storage. When you're done, simply recycle them! Not dishwasher-safe. 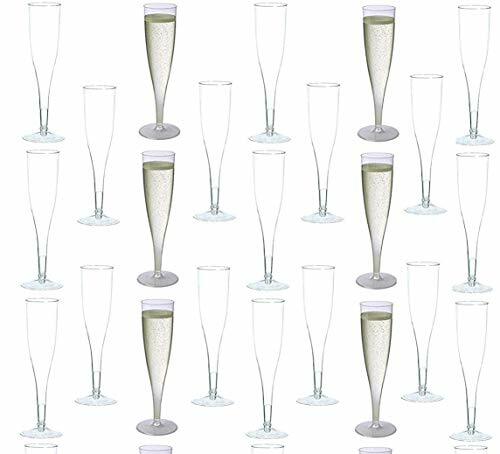 AMAZING QUALITY AND CUSTOMER SERVICE - We made the best quality champagne flutes and we back it up with a one-year manufacturer warranty. Expect only the best customer service from us. Reach us any time! 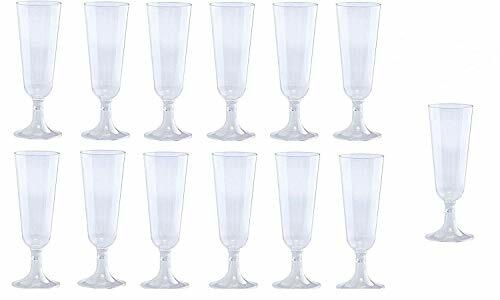 Whether you are planning a big event or wish to add little style into your friends' tea parties, these crystal clear plastic handle cups are a must have. The sleek finish and exceptional transparency of these cups will enhance the lusciousness of your drinks manifold. Made from premium quality clear plastic that mimic real glass, these cups can efficiently hold hot or cold drinks, while still adding elegance to your coffee or tea tables. The attribute of disposability makes the cleaning up time a breeze, while the shatter proof heavy duty plastic make these cups completely safe to be used for children and family based parties. With a convenient handle attached to the cup, now it's so easy and comfy to enjoy your hot tea, cappuccino, coffee, and other refreshing drinks. 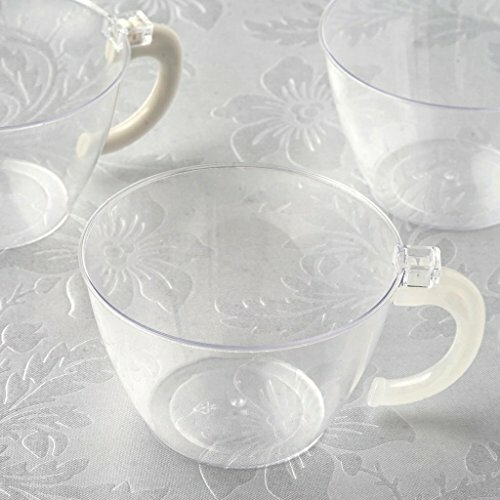 Bring a modish twist to your tea parties and family dinners with our clear coffee/tea cups that exude the sophistication of real glass and refined finishing.